The OSIRIS-REx mission will whip around Earth to build up speed on its journey to Asteroid Bennu. After already traveling millions of miles into space, a NASA asteroid probe will soon return to Earth to take advantage of the planet's gravity. 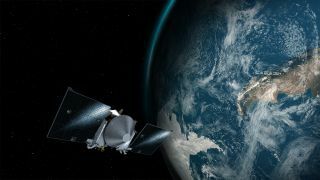 At 12:52 p.m. EDT (9:52 a.m. PDT) on Friday (Sept. 22), NASA's OSIRIS-Rex spacecraft will zoom 11,000 miles (18,000 km) over Antarctica at a breakneck speed of 19,000 mph (31,000 km/h). Using Earth's gravity, the probe will adjust its orbit so it can rendezvous with near-Earth asteroid Bennu in late 2018. But if OSIRIS-REx is going to an asteroid, why did NASA bring the probe back to its home planet after it had already traveled 600 million miles through interplanetary space? "The Earth gravity assist is a clever way to move the spacecraft onto Bennu's orbital plane using Earth's own gravity instead of expending fuel," Dante Lauretta, OSIRIS-REx principal investigator at the University of Arizona, Tucson, said in a statement. Gravity assists are commonly used in spaceflight to adjust the speed and orbits of spacecraft. The maneuver was first theorized by Soviet mathematician Yuri Kondratyuk around 1919. Using the gravity of planets in the solar system to slingshot around the solar system can save fuel, allow spacecraft to get to their destinations faster and, ultimately, increase the amount of science that can be done. "It's smart, it's cheap, and it's phenomenally clever … it's a bit like interplanetary billiards," said Shadan Ardalan, orbit determination lead for NASA's Juno navigation team, who is not involved in the OSIRIS-REx mission. "You're just banking off the other planets in order to make that shot in the corner pocket," he told Space.com. To speed up a spacecraft, you need to "steal speed" (or take momentum) from a planet, Ardalan said. To do this, scientists send a spacecraft past in the same direction the planet is traveling. During the flyby, a minuscule amount of momentum will be stolen from the planet, boosting the spacecraft's speed. Basic laws of physics say that momentum must always be conserved, so if the spacecraft gains momentum, the planet must lose momentum. But because planets are so massive, their momentum change is a vanishingly (and immeasurably) small proportion of their total momentum. The boost in momentum (and therefore speed) for the tiny spacecraft, however, can be huge, depending on how close the flyby is and at what angle it approaches, said Adralan. "With missions that fly to the outer planets — like Voyager, Cassini and Galileo — all of those missions required us to speed up the spacecraft," Ardalan said. But if you want to send a spacecraft to the inner planets, you must do the opposite and slow the spacecraft down, he said. To do this, you send a spacecraft in the opposite direction to a planet's orbit, and during the flyby, the planet's gravity will sap momentum from the spacecraft, thereby reducing the vessel's speed. The sun’s gravity will then cause the spacecraft to spiral inwards, shrinking the spacecraft’s orbit. When NASA's MESSENGER mission traveled to Mercury, for example, it used gravitational assists from Earth, Venus and Mercury to remove momentum, ultimately putting it on a path and speed that allowed it to become the first spacecraft to orbit the tiny world. "It all depends if you're flying with the momentum of the planet or against the momentum of the planet," said Ardalan. When OSIRIS-REx encounters Earth's gravitational field on Friday, the spacecraft will not use the planet's gravity to speed up or slow down; instead, the probe will use our planet to tweak its direction of travel. Asteroid Bennu's orbit around the sun has an inclination of 6 degrees from the plane of the ecliptic. The solar system's ecliptic can be imagined as a flat disk that represents the average locations of the planets as they orbit the sun. Bennu's orbit pops up through this plane by 6 degrees; OSIRIS-REx's flyby will swing the spacecraft over Antarctica to fling the probe out of the ecliptic plane and toward Bennu while conserving fuel. The OSIRIS-REx spacecraft will fly by Earth, using the planet's momentum to swing it up into a higher inclination where Asteroid Bennu orbits. "[OSIRIS-REx] could have been launched at Bennu and traveled straight there, but it would have used all its propellant for operations to get there" and would have had nothing left for science operations, Ardalan said. Gravity assists to change the inclination of spacecraft orbits can have dramatic effects. The NASA/European Space Agency Ulysses mission used Jupiter's powerful gravity to fling the solar spacecraft over the poles of the sun in 1992, increasing the probe's inclination by nearly 90 degrees. Gravity assists can also be used to "kill" spacecraft. "Cassini's gravity assists [at] Titan are what enable[d] that mission be as successful as it was," said Ardalan, who served as senior member of the Cassini navigation team until 2011 before becoming lead navigator for Juno. "Titan was the engine that powered Cassini all over the Saturnian system for 13 years … and ultimately, it was one last, distant gravity assist from Titan on Sept. 11, 2017, one last goodbye kiss, that put Cassini on her final trajectory into Saturn on the 15th..'"
OSIRIS-REx, however, is simply using Earth's gravity like a slingshot, so the probe can match Bennu's orbit around the sun. The spacecraft is on its way to orbit the 500-meter-wide (1,640 feet) asteroid and collect samples from the object's surface to return to Earth, helping researchers better understand what these interplanetary space rocks are made of.